We’ve talked about fans who keep a favorite card in their wallet before, frequently referred to on social media as a #WalletCard. 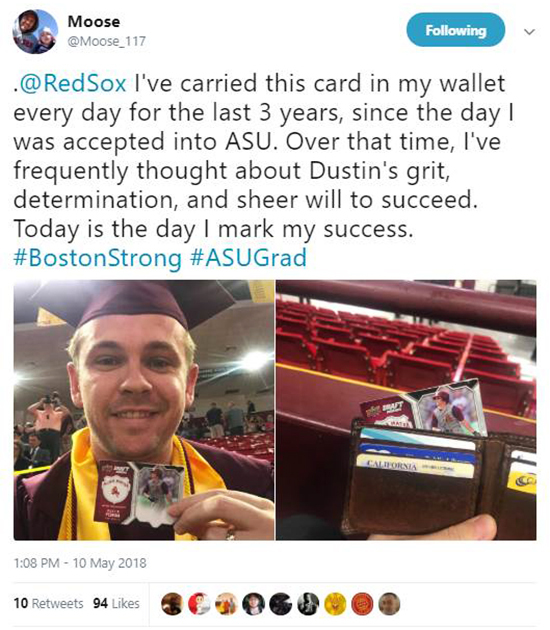 With it being graduation season, we loved a tweet we saw this week where a fan shared his Upper Deck wallet card after he walked in his graduation ceremony. “I’ve loved the Red Sox since I was a kid, back when they still found new and creative ways to break your heart. 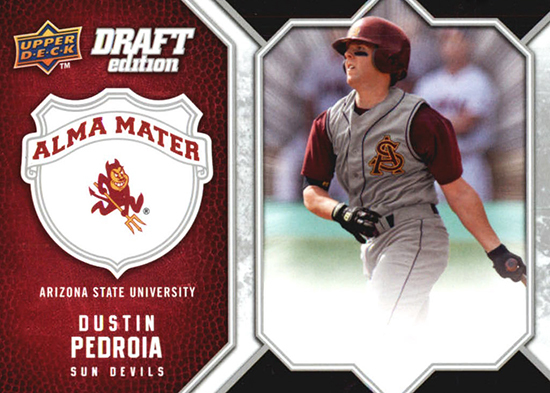 Dustin Pedroia has always been my favorite player since he got called up. The first jersey I ever bought for any sport was Pedroia’s. He embodies everything you want in a ballplayer. If you’re a little league coach, just show the kids film of Pedroia and they will learn to player with game right. He’s the perfect example of hard work paying off. “On top of all that, he played at ASU, the school I just graduated from. The day I got accepted to ASU, I pulled that card from an Upper Deck box and put it in my wallet, where it’s stayed ever since. I did school while working 50 hours per week and raising a family with my wife. We just had our third child this past October. Hard work and personal discipline were critical to my success, just as they were for Pedroia. So long story not so short, that’s why I’ve carried THAT particular card with me for the last three years. Moving forward I think it will sit with my diploma. If I ever get the chance, I’d love to get him to sign it for me. Congratulations Moose! We wish you all the luck in the future!